The Old Foodie: Pork, Pease, and Pie? Queen Elizabeth I was released from the Tower of London at one o’clock on this day in 1554, and according to popular legend she went first to church to give thanks, and then on to the King’s Head Tavern in Fenchurch St (sadly no longer there), for a meal of boiled pork and pease pudding. It is highly unlikely that the cook at the tavern could read, never mind own a cookbook, cooks learned on the job how to make the standard dishes such as pork and pease. Naturally then, a cookbook published around about this time with the impressive title of “A Propre newe Booke of Cokerye, declarynge what maner of meates be beste in season, for al times in the yere, and how they ought to be dressed, and serued at the table, bothe for fleshe dayes, and fyshe dayes. With a newe addition, verye necessarye for all them that delyghteth in Cokerye” assumed this knowledge and did not include recipes for them. 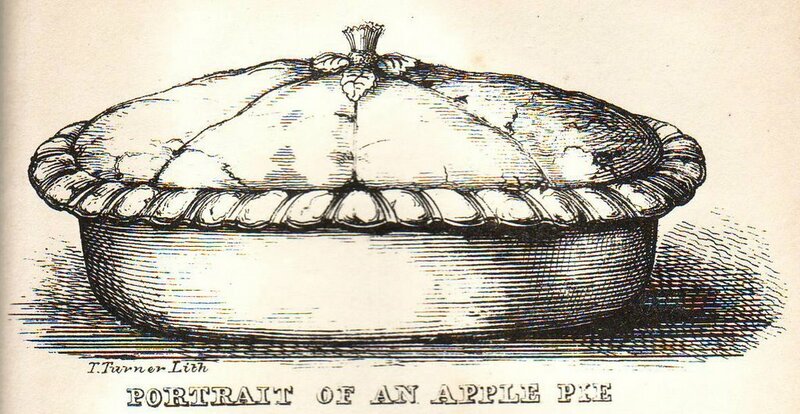 We dont know if Her Majesty had any “dessert” (not that this course existed then as it does now), but there are some good things in the Propre Book which would have been very suitable, such as these pies. Take your apples and pare them cleane and core them as ye wyll a Quince, thenmake youre coffyn after this maner, take a lyttle fayre water and half a dyche of butterand a little Saffron, and sette all this upon a chafyngdyshe tyll it be hoate then temperyour flower with this sayd licuor, and the whyte of two egges and also make yourcoffyn and ceason your apples with Sinemone, Gynger and Suger ynoughe. Then putte them into your coffin and laye halfe a dyshe of butter above them and so close your coffin, and so bake them. Take goseberies and parboyle them in whyte wyne, claret or ale, and boyle withall a lyttle whyte breade, then take them up, and drawe them throughe a strayner asthycke as you can with the yolckes of syxe egges, then season it up with suger, halfe adische of butter, so bake it. … apple pye with custard all on the top, it's the most acceptable entertainment that could be made; they scald their creame and milk in most parts of these countrys and so its a sort of clouted creame as we call it, with a little sugar, and so put on top of the apple pye; I was muched pleased with my supper … . It is quite possible that the cook could read in 1554, and very likely indeed by the end of Elizabeth’s reign. The Elizabethan period was one of the most educated societies in English history, but this fact is hidden by the changing definition of literacy. In 1554 the English language was in transition from a vernacular to an official langauge. Shakespeare would certainly be an Elizabethan high-point of this process, which one could argue reached a pinnacle with the King James Bible. In Tudor times Latin was the langauge of literacy. (Previous English monarchs spoke French and Latin, but not English.) It would be unlikley that a cook would read or write Latin, but there are actually more illiterate English readers in modern society than in the Elizabethan period. Thanks for your clearly very erudite comments. I am delighted to have a new insight into the period. Who are you? Do you wish to tell?